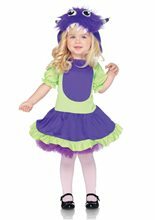 Gerty Growler Moster Child Girl Costume; Gerty Growler Moster Child Girl Costume-2 PC. Gerty Growler, includes dress with zig zag tiered skirt and furry monster hood with pom pom ties. 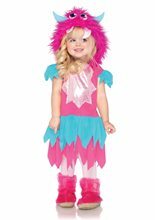 Monster Miss Toddler Costume; Monster Miss Toddler Costume includes dress with mesh layered skirt, 2 fingerless gloves, 2 plush leg cuffs and plush hood with animal face and pom poms. Stockings not included. 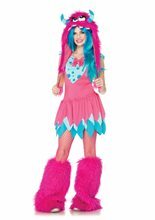 Monster Miss Child Costume; Monster Miss Child Costume includes dress with mesh layered skirt, 2 fingerless gloves, 2 plush leg cuffs and plush hood with animal face and pom poms. Stockings not included. Growling Gabby Monster Child Girl Costume; Growling Gabby Monster Child Girl Costume-Growling Gabby, features dress with tattered skirt and attached furry monster hood and tail. Cuddle Monster Toddler Girl Costume; Cuddle Monster Toddler Girl Costume-Cuddle Monster, features ruffle trimmed dress with attached furry monster face hood. Furball Fergie Monster Child Girl Costume; Furball Fergie Monster Child Girl Costume.Furball Fergie, features slashed suspender dress with tattered skirt and attached furry monster hood and tail. 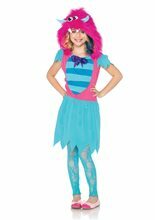 Mischief Monster Child Girl Costume; Mischief Monster Child Girl Costume 2 PC. Mischief Monster, includes dress with tiered skirt and furry monster hood with pom pom ties.